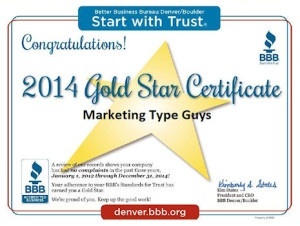 Shameless self-promotion post here… We are pleased to announce that Marketing Type Guys was one of the BBB’s 2014 Gold Star Recipients! 2014 BBB Gold Star certificates are awarded to Accredited Businesses with no complaints in a three-year period – 1/1/2012 – 12/31/2014. Kudos to us!